Increasingly, new employees and junior members of any profession are encouraged-sometimes stridently-to "find a mentor " Four decades of research reveals that the effects of mentorship can be profound and enduring; strong mentoring relationships have the capacity to transform individuals and entire organizations. Organizations that retain and promote top talent-both female and male-are more likely to thrive. But the mentoring landscape is unequal. Evidence consistently shows that women face more barriers in securing mentorships than men, and when they do find a mentor, they may reap a narrower range of both career and psychological benefits. 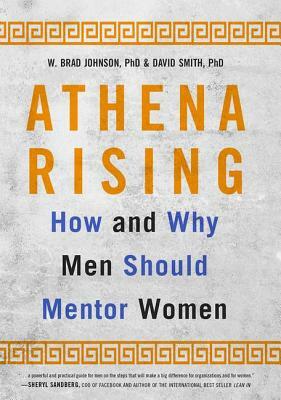 Athena Rising is a book for men about how to mentor women deliberately and effectively. It is a straightforward, no-nonsense manual for helping men of all institutions, organizations, and businesses to become excellent mentors to women. Co-authors W. Brad Johnson, PhD and David Smith, PhD draw from extensive research and years of experience as experts in mentoring relationships and gender workplace issues. When a man mentors a woman, they explain, the relationship is often complicated by conventional gender roles and at times hostile external perceptions. Traditional notions of mentoring are often modeled on male-to-male relationships-the sort that begin on the golf course, involve a nearly exclusive focus on career achievement, and include more than a few slaps on the back over drinks after work. But women often report a desire for mentoring that integrates career and family aspects of life. Women want a mentor who not only "gets" this, but truly honors it. Men need to fully appreciate just how crucial their support of promising junior women can be in helping them to persist, promote, and thrive in their vocations and organizations. As women succeed, lean in, and assume leading roles in any organization or work context, that culture will become more egalitarian, effective, and prone to retaining top talent. W. Brad Johnson, PhD is professor of psychology in the Department of Leadership, Ethics, and Law at the United States Naval Academy, and a faculty associate in the Graduate School of Education at Johns Hopkins University. A clinical psychologist and former Lieutenant Commander in the Navy s Medical Service Corps, Dr. Johnson served as a psychologist at Bethesda Naval Hospital and the Medical Clinic at Pearl Harbor where he was the division head for psychology. He is a fellow of the American Psychological Association and recipient of the Johns Hopkins University Teaching Excellence Award. He has served as chair of the American Psychological Association s Ethics Committee and as president of the Society for Military Psychology. Dr. Johnson is the author of more than 100 journal articles and book chaptersmany on the topic of mentoringand 12 books, in the areas of mentoring, professional ethics, and counseling. Books of related interest include: On Being a Mentor: A Guide for Higher Education Faculty (2nd Ed.) (2015), The Elements of Mentoring (Revised Ed.) (2008, with Charles Ridley), The Elements of Ethics for Professionals (2008, with Charles Ridley), and Becoming a Leader the Annapolis Way (2006, with Greg Harper). David Smith, PhD is an active duty U.S. Navy Captain and permanent military professor in the Department of Leadership, Ethics, and Law at the United States Naval Academy having served four years as the chair. A former Navy Pilot, Dr. Smith led diverse organizations of women and men culminating in command of a squadron in combat and flew more than 3,000 hours over 19 years including combat missions in Iraq and Afghanistan. As a sociologist trained in military sociology and social psychology, he focuses his research in gender, work, and family issues including dual career families, military families, women in the military, and retention of women. Dr. Smith is the author of numerous journal articles and book chaptersmany on the topic of gender and the workplace. His most recent publications include: On the Fast Track: Dual Military Couples Navigating Institutional Structures in Contemporary Perspectives in Family Research (2013), Dual Military Families: Confronting a Stubborn Military Institution in Military Families and War in the 21st Century, Comparative Perspectives (2015), Leadership and Peer Behaviors: Women in Combat in Military Medicine (2016) and Gender and the Military Profession: Early Career Influences, Attitudes and Intentions. in Armed Forces & Society."